Common pink (Dianthus cv. ): growing, planting, caring. The pink-coloured flowers in the family! Although some cultivars, of course, are on the market with other colours - like ‘Lady in Red’ or ‘Haytor white’. 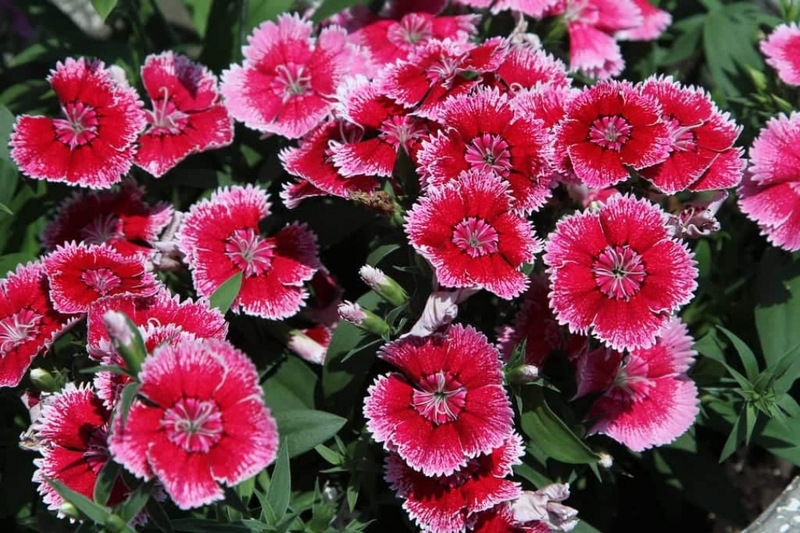 Scientific name : Dianthus cv. A compact member of the Dianthus genus, common pink is a ground cover evergreen reaching on average 30–60 centimetres (12–24 in) of height, with opposite, simple, linear and sessile, 10 centimetres (3.9 in) long leaves and pink (for the type species) 10–15 millimetres (0.39–0.59 in) wide flowers, with fringed margins from May through August. The old common pink are persistent, vigorous, and most form compact domes. Each flowering stem bears in June from 4 to 6 single, double or semi-double flowers, scented, 3 to 6 cm in diameter. They can be "unicolour", "two-toned" or "nuanced". Modern common pink have a compact rounded tuft habit, 3-6 cm flowers, which come in two or three waves of bloom from June to October. Common pink are biennials or ephemeral perennials used in biannuals are sown in place in autumn, or under shelter in March, to obtain a bloom the same year. Cover with a very shallow layer of compost because seeds need light to germinate. Plant the seedling between two and four weeks after planting (as soon as the plant is sufficiently developed to be handled). Carefully separate the seedlings and replant individually in a bucket filled with transplanting soil, or a mixture of soil and well-decomposed compost. Water copiously at the plantation, then every day during the first weeks. The potted common pink outside needs to be protected from the cold weather. In early winter, bring them in, or wrap them in insulation material. The common pink is multiplyed by seed, so consider harvesting seeds in summer, and sowing them under shelter from February. Beware, some hybrids have low fertility, so you may need to get new seeds.